Great set of reviews. One of the most enjoyable, poignant experience in film. Glad you enjoyed my set of reviews. Thanks, you should cetainly watch it again. It’s well worth it. Thanks, the sheer scope and excitement it generates can’t be beaten. Thanks for the link Cindy, I will check out your post. Good review Vinnie. All jokes aside about the numerous times this could have ended, the movie’s still pretty freakin’ epic and doesn’t miss a beat when it comes to getting right down to the end of this adventure. Thanks, epic is certainly what it is. Thanks, I could watch them again and again as well. Now that would make for incredibly epic viewing. Thanks for the comment, glad you’ve enjoyed reading my reviews. Yes, a great review of a great movie! I will be re-watching the entire trilogy soon, on New Year’s Day – it has become an annual tradition. Thanks, enjoy watching it again on New Year’s Day. Great review! Absolutely love the entire trilogy. Thanks it ranks as one of my favourite movie trilogies as well. I think the ending(s) went on a big in this one,but you have made me want to watch them all again now Vinnie! Thanks, watching them all in one go is epic. One of the best of the decade and of all-time. Well said, it is such an epic movie. Sorry to fling a wet blanket, but this was my least favourite. (Not that any of them could be so described) By the time this came around, I was just thinking “more of the same.” And it was. Glad you loved it so much, and you certainly got that across to the reader mate. I like that my passion shone through in my writing. The movies are in my view one long film, that flows seamlessly together in carrying an epic story to emotional and fantastic heights. Thanks for commenting on my reviews, I gotta sign off for the night now. I really enjoyed these LOTR conversations. Plenty more in the future! I feel I should really dedicate more Blog posts to Peter Jackson and LOTR! I look forward to reading anything related to LOTR. Speak to you soon Caz, I need to catch up on my sleep now. I totally agree! The best franchise films are ones that deliver on the massive expectations of their predecessors, which is clearly very hard to pull off. Return of the King does so in such magnificent fashion that it’s the greatest film ever, IMO. It’s the most wonderful way to wrap things up with deep emotion, breathtaking style and all around magic. 11 for 11 at the Oscars, a clean sweep. In a Hollywood industry where third films in most trilogies/franchises are poor, this film stood high. I agree with everything you put in this review. Viggo Mortensen really gave it his all and gave us such a memorable character. Also, just the other week I was listening to “Into the West” by Annie Lennox, which won Best Original Song. Very beautiful and fit perfectly to end the story. And another great review sir. 3 out of 3! It deserved every Oscar it got for the masterful achievements of those involved. I love Into the West, Annie Lennox has such a poweful voice that is beautiful to hear. Great review on this trilogy, vinnieh! 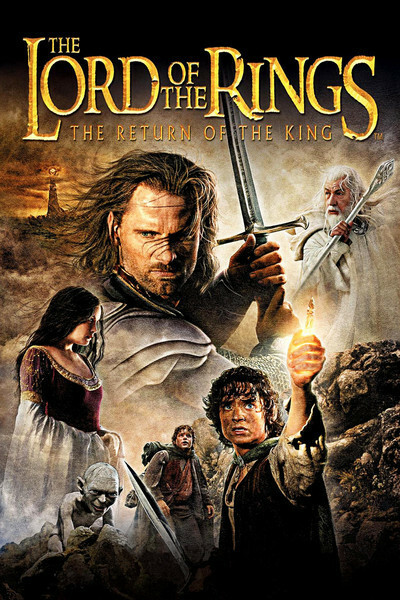 ‘The Return of the King’ is my favourite out of the three movies in this LOTR trilogy. Spellbinding is the word for it, and I’m very impressed with the performances of the cast; Peter Jackson’s directing and the impressive CGI effects for the battle sequences which are so majestic. It’s no surprise that this film won so many Oscars according to the DVD documentaries. Cheers, this movie just exudes epic in every frame and thoroughly merited all the Oscars it won. You really couldn’t ask for anything more. Jackson sets it up so good that I was wondering if he could finish strongly. He finished with aplomb and actually delivers the best film of them all. Such a great film and thoroughly deserving of its Oscars. The awards were only a reflection of this cinematic achievement with the three films. Masterfully told! This film just exudes that epic quality that sweeps you up as the saga concludes with emotional heights and stunning work. Jackson was on fire here and this movie deserved every award given to it. Thank you for reading through these reviews. These reviews are as epic as the trilogy! Plucky, I like that word. I like to steal words from fellow writers. If you see that word in an upcoming review, you will know why! I think Andy Serkis is such a talented guy. I like seeing him perform roles without CGI too, and this one (as Smeagol) had to be one of the first if not the first? I’m so pleased that Serkis is on board with Star Wars. To use a music analogy, it’s like when a favourite lead guitar player of mine joins a favourite band of mine. Feel free to use the word plucky. Serkis is a really talented guy, he competent embodied Gollum. The word plucky will be used! Can’t wait to see it used.